Heavy fighting is reported at the outskirts to Viipuri, as the Red Army continues its attempt to capture the city. This prompts the Finns to seek an immediate armistice, which the Russians refuse. Therefore the Finnish delegation in Moscow is instructed to sue for peace. The US Senate passes the ‘Lend Lease’ bill by 60 votes to 31. Martial law is proclaimed in Holland in order to extinguish any anti-Nazi protests. The RAF use GEE for the first time for target marking during a raid on Essen. The technique was known as ‘Shaker’ and consisted of aircraft marking the target with flares, allowing aircraft further behind to see the target more clearly. However the results of the raid were disappointing. Rangoon falls to the Japanese as the British forces escape to the north. The 17th Indian Division was now holding the Irrawaddy area and the 1st Burma Division the upper Sittang valley. The Chinese Expeditionary Force were farther north, with the Fifth Chinese Army defending Mandalay and the 6th Chinese Army was at Toungoo and defending the Burmese province of Shan. Japanese make unopposed landings at Lae and Salamaua on New Guinea. The Dutch on Java surrender to Japanese. Over 1,000 Germans wives of Jewish men deported to concentrations camps are now protesting in Berlin. To prevent this kind of protest from spreading, Joseph Goebbels orders the release of the 1,500 Jewish men. Japanese forces attack American troops on Hill 700 in Bougainville. The battle will last five days. 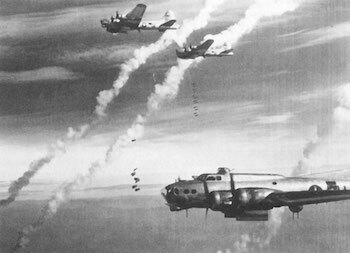 The US 8th Air Force carries out a heavy attack against Berlin. The primary target is the ball bearing plant at Erkner, a suburb of Berlin; enemy opposition is fierce and 37 bombers and 16 fighters are lost. British and Canadian troops involved in Operation ‘Blockbuster’ enter Xanten on the Rhine after several days of heavy fighting further to the South U.S. troops enter Bonn. The Red Army penetrates into the ssouthern suburbs of Breslau.